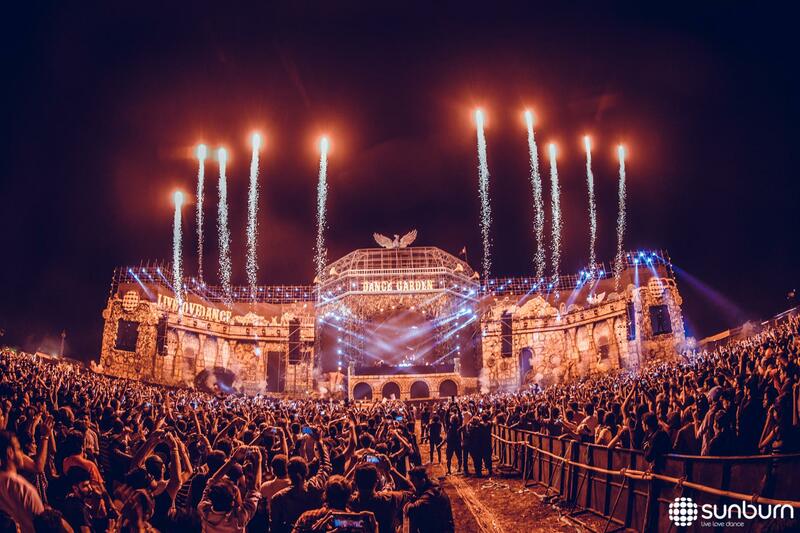 Among the top 10 music festivals in the world the Sunburn Festival has been Asia’s a final music frontier for celebrating music and spreading groovy vibes in people with Electronic Dance Music. Ranked by CNN in the year 2009, Sunburn Festival stood among the Top 10 major music festivals in the world. It started in the year 2007, at Candolim Beach in Goa. The festival created a lot of buzz since the time it started. It developed craze and stood as a trendsetter among youngsters and teenagers. The event brand began in Goa and expanded to Mumbai, Delhi, Bengaluru, Pune and more. The 10th edition of Sunburn, 2016 celebrated last year was just another music festival that evolved to an aspiring brand with millions of loyalists. Though Sunburn 2016 was shifted to Pune from Goa, but had set sights, specifically in the Kesnand Hills area. Despite all the controversies dogging up, the 10th edition was a massive success comprising of star DJs and big names. The event was held at a privately-owned 90 acres of land at Kesnand from December 28 to 31. Amid the pollution free atmosphere, Sunburn last year captured huge campsite chopper rides, karaoke sessions, flea market and bowling among a host of other activities. Similar to the 10 edition, the 11th edition of Sunburn 2017 is already set in place! The Indian festival heavyweight is back with some major news to amp up the hype even more. The four-day music festival is going to be eclectic mix of music, entertainment, experiences, celebration and lifestyle that has seeded music tourism in India. Sunburn 11 is stepping towards creating lifetime memories with its fans. The line-up for this year is one of the popular and most exciting for celebrating the year really close on a high. To enhance the overall festival, Sunburn 11 has raised bar by integrating the latest technology and SFX. Let’s check out the line-up this year for entering a new decade that plans to give you a whole new experience and thrills. Let’s check out the line-up this year for entering a new decade that plans to give you a whole new experience and thrills. Headliners: Dimitri Vegas and Like Mike: Dimitri and Michael Thivaios, the anthem makers of Tomorrowland festival, now stand among the most popular and hold a fame-name among top DJs in the world. In 2015, DJ Mag announced the duo as the New No. 1 DJ, dethroning Hardwell after being in the throne for 2 years consecutively. Having backed by makers of Tomorrowland delivered an audio visual feast to more than 60,000 illuminated and buzzing music lovers throughout the show. The duo picked three awards last year including Best Global DJ, Best Big Room DJ and Best Music Video for their highly anticipated track ‘The hum’. The Belgian Brothers this year is going to catch every heart of the music lovers in Sunburn 11. Headliners: DJ Snake: William Sami Etienne Grigahcine or DJ Snake who debuted with his popular single ‘Turn Down for What’ in 2013 topped the Billboard Dance chart giving hall of fame to this French music maestro. The video collaboration with Lil John in fact was nominated for Best Music Video award category for Grammy in 2015. Another top hit ‘Lean On’ won the Billboard Music Award in 2016. Coone: The Belgian jumpstyle and hardstyle producer and DJ started his career at a very young age. Ranked as a hard style DJ as well as producing with popular artists like Dimitri Vegas & Like Mike, Coone is ready to set the Sunburn 11 stage on fire. Kayzo: Hayden Capuozzo or best known as Kayzo is best known for incorporating the trap and hairstyle genres into his remixes. His collaboration with RIOT ‘Wake Up’ received quiet a brilliant number of hits in less than 24 hours. He featured in the MainStage lineup of Nameless Music Festival 2017, in Brazio, Italy. Headliners: Clean Bandit: The British mash classical music and pop group best known for their hit single ‘Rather Be’ is a crossover group that gave a new dimension to EDMs. Their form of airy and dreamy yet sound driven sound was like a chamber music version of house music. With their four core members Grace Chatto, Jack Patterson, Luke Patterson and Neil Amin-Smith, the group is looking forward to rock the Sunburn 11 crowd. Nucleya: The Indian leader in the global bass movement has emerged as one of the most thrilling & arresting producers in the Indian scene in the past 5 years. He made his mark as an Indian EDM producer, focusing on sounds and textures that are Indian yet having International appeal. He has performed at umpteen EDM festivals around the world. Headliners: Martin Garrix (Special NYE Perfomance): The Dutch musician and record producer known for his musical leadership in genres like progressive house and electro house started his career in the music industry at an early age. He collaborated with popular artists like AfroJack, Dimitri Vegas & Like Mike, Usher and many more. In 2016 he created his own label ‘STMPD RCRDS’. AfroJack: Surprise Surprise ! Just 15 days before the concert, Sunburn announced, AfroJack is going to be on stage for New Year’s Eve performance. 1 Ticket which allows only 1 person will cost you ₹7,000 + Taxes. 1 Ticket which allows only 1 person will cost you ₹6,000 + Taxes. 1 Ticket which allows only 1 person will cost you ₹11,000 + Taxes. For General Admission: ₹3,000 per person + Taxes. For VIP Admission: ₹6,000+ Taxes. For General Admission: ₹4,000 per person + Taxes. For VIP Admission: ₹7,000+ Taxes. For Early Entry till 03:00 PM, General Admission: ₹1,250 per person + Taxes. After 03:00 PM, Entry will not be allowed. For General Admission: ₹2,000 per person + Taxes. For VIP Admission: ₹3500+ Taxes. SOLD OUT: For Early Entry till 03:00 PM, General Admission: ₹2,000 per person + Taxes. After 03:00 PM, Entry will not be allowed. For General Admission: ₹2,750 per person + Taxes. For VIP Admission: ₹4000 + Taxes. Phase II(Sold Out): Early Bird General and VIP Entry are available with 40% Discount. Early Bird General Entry: ₹5,952 + Taxes / per person. Early Bird VIP Entry: ₹9,984 + Taxes / per person. Venue Location: Oxford Golf Resort, Lavale, Pune Pimpri-chinchwad. Considering the traffic controversies last year, the new venue is aiming to provide the audience a hassle-free entry to the festival area. Comprising one of the biggest artist line-up this year and grand stage, the venue would give easy access with better parking facilities to avoid traffic congestion as well. To top it all of once again give this mega music extravaganza a true festival feel it will host India’s biggest campsites. Among a host of other activities, this year it will have after parties, adventure activities, camp fire and workshops. Age Limit: The age limit to enter the event is 15+ years. Timings: The duration of everyday event is 8 hours. Door Opens at 01:00 PM but the event starts at 02:00 PM and ends at 10:00 PM. Last entry is possible till 08:00 PM.